John Christopherson was a painter of small dreamlike townscapes and abstract paintings that combine an almost naïve intensity with great sophistication. Born in Blackheath, London in 1921, Christopherson began his working life at Shell-Mex House in 1938, the period when Jack Beddington, the manager of the publicity department was pioneering the use of modern art in advertising. After a wartime illness, Christopherson worked at County Hall in London, choosing for his office wall a print of Paul Nash's Wood on the Downs and Nash's primeval landscapes and magical moons were later to have a lasting influence on Christopherson's own paintings. In 1950, while working as a civil servant at the Geological Museum in South Kensington, he became interested in the French Art Brut movement and corresponded with Jean Dubuffet, who offered encouragement when Christopherson himself began to paint. John Christopherson felt that his life in art did not really begin until 1950, when he met Jacob Epstein and started to visit West End galleries - he said that it was a revelation that 'such a magical world co-existed on the same level and at the same time as the boring, prosaic one of rationing, coupons and the civil service', and he determined to enter it. He said that his annus mirabilis was 1951, the year of the Festival of Britain. This was the time when his tastes and interests were moulded and when he found his vocation. In 1959, he resigned from his appointment in the civil service at the Geological Museum and became a full-time painter. From boyhood he was fascinated by the idea of antiquity. He was always interested in ancient stones, pavements, mosaics, archaeological sites, walls and buildings which had gradually changed and been eroded by time. Walls with faded posters and graffiti particularly attracted him - he treasured and identified himself with what he described as the 'forlorn poetry of the unregarded'. In 1958, Christopherson married his wife Anne, also a painter. After living in Blackheath until 1962, they moved to Hampstead Village before moving back to his native Blackheath in 1967. Both locations provided the subjects for many of his mature paintings. He was of Cornish ancestry and regularly visited St Ives, home to many of the British artists of the 1950s whom he admired. However, his main influences were really from the Continent: artists such as Tàpies, Brancusi, Giacometti, Fautrier, Burri, de Staël, Poliakoff, Richier, Wols, Balthus and Veiera da Silva. 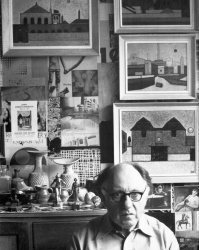 In England, he particularly admired the works of Ben Nicholson, Eduardo Paolozzi, William Scott and his old friend Alan Reynolds. He once said, 'I like a painting that hangs on a wall, or a sculpture that stands on a stand... nothing much that has happened since the 1950s really interests me.' The post-war years are usually thought of as a time of austerity, but for Christopherson 'the bleak world of Giacometti and William Scott was good enough for me'. Christopherson exhibited his work from 1961, showing often at the Leicester Galleries, the Marjorie Parr Gallery and Agnews. In 1989, he showed his predominantly abstract paintings and collages from the 1960s at England & Co, where he continued to exhibit regularly. His last exhibition was a retrospective in December 1995 at the Woodlands Art Gallery in Blackheath. He died in 1996 and the following year there was a memorial exhibition at England & Co accompanied by a publication about his life and work. His correspondence and scrapbooks are now in the Tate Archive.